With its pretty peaked roof and hand-hewn oak beams, it’s clear there’s nothing off-the-peg about this stunning kitchen-diner. ‘Building the extension was exciting because it was our first project together, and we wanted to get it right,’ says Deborah. The aim was to bring light, space and elevation to the rear of the property, and to connect it with the garden that Deborah plants and prunes with green-fingered passion. 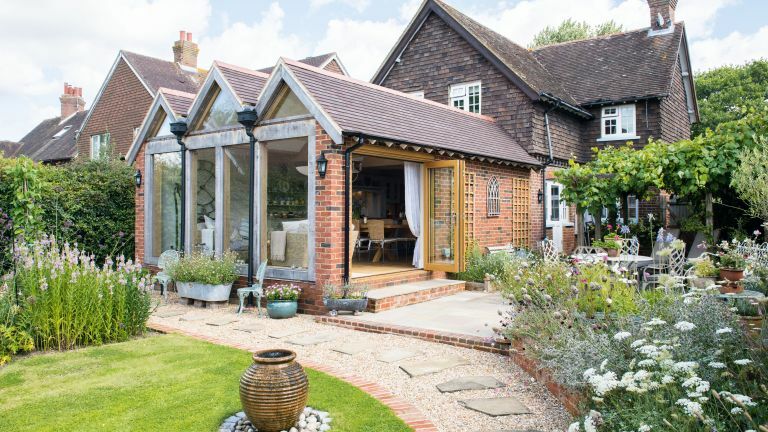 As the property sits within a Conservation Area, the couple wouldn’t have been allowed to build a double-storey extension even if they’d wanted to. ‘Not building high gave us freedom to be more creative,’ says Deborah, who worked with an architect to reflect the quirky roofline of the house with three gables. Huge green oak beams support the structure, with eight Velux windows running along the central peaked roof to flood the room with light. ‘I envisioned it as a barn, but I think it’s more like a cathedral,’ Deborah laughs. The attention to detail was worth it to create a layout that functions well and flows easily from one area to the next. ‘I love cooking, and this kitchen is the most practical I’ve ever had,’ says Deborah.